Highly readable soft yellow dice. Create math and counting activities. 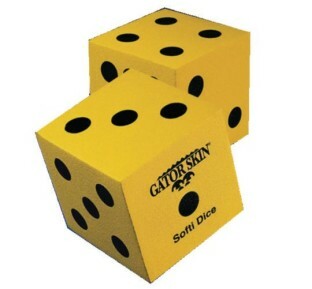 Play traditional dice games or create fun, new games. Size: 5" x 5" x 5". Certified Latex Free. The extra cost is worth it for any Gator Skin product. They are super durable and last a long time even with repetative use with dozens of kids. Patients and staff alike are charmed by these dice! The novelty of oversized dice does not seem to wear off. I use these for kid's games and also for give-a-way games for adults and kids. My summer recreation program staff love our new dice! One of their favorite uses is for playing giant Yahtzee. I bought 3 pair.